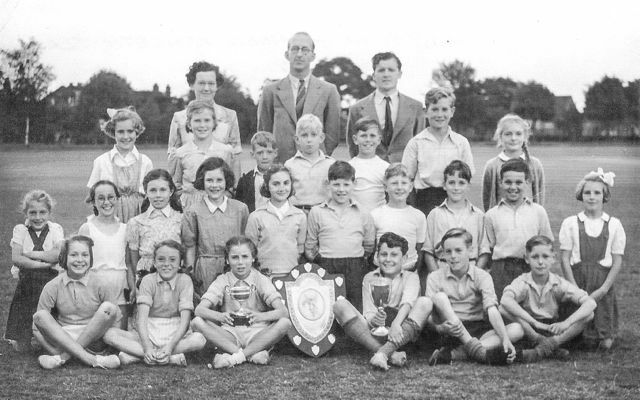 For the first decade of Fleetville's existence children attended Camp School. The parents complained vociferously and the Education Authority agreed to purchase land intended for homes between Tess Road (now Woodstock Road South) and Royal Road. The main building of Fleetville Elementary School opened in 1908. 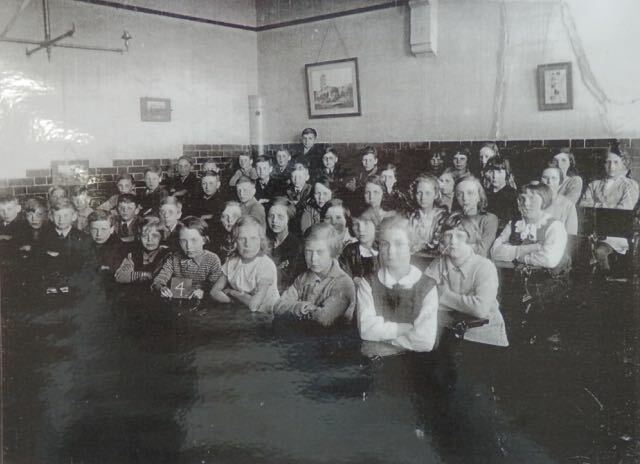 Classrooms had to accommodate infants, juniors and seniors. The small building was added c1912. Designation to Primary was achieved by 1935, but the two departments were separately managed. Shortly afterward a "hut" of two temporary classrooms arrived. 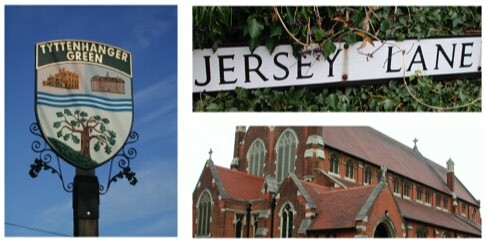 The nursery moved onto the site c1976 and the junior department moved to the south of Hatfield Road c1979. 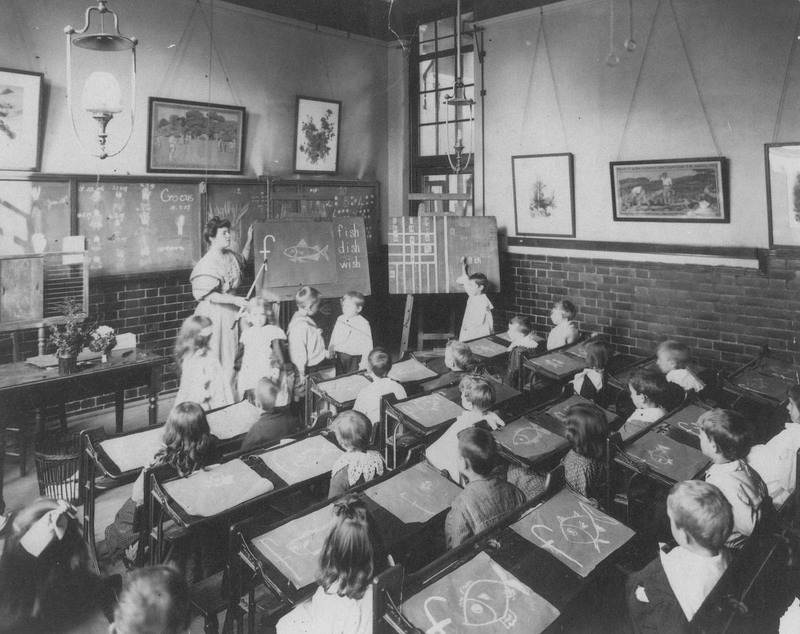 Mr and Mrs C Wimbrey were the first head teacher and teacher in charge of the Infants department. They had transferred from Camp Schools. After retirement they were replaced by Mr R W Fox and Miss G Lewis. In 1927 another head teacher from Camp arrived. He was Mr A W East, who retired in 1948, to be followed in turn by Mr Dawe and Mr P Jenkyns. BACK ROW L-R: Jennifer Marsh, Patricia Folds, Mary Kendall, ? , ? , ? , Susan Scott, ? , ? , Jacqueline Hall. THIRD ROW L-R: Jennifer ….. , ? , ? , ? , ? , ? SECOND ROW L-R: ? , ? , ? , Gillian Andrews, ? , Charles Hammond, ? FRONT ROW L-R: ? , ? , Rachel Stone, ? , ? BACK ROW L-R: ? , ? , ? , ? , ? FRONT ROW L-R: ? , ? , ? , Peter Saban, ? 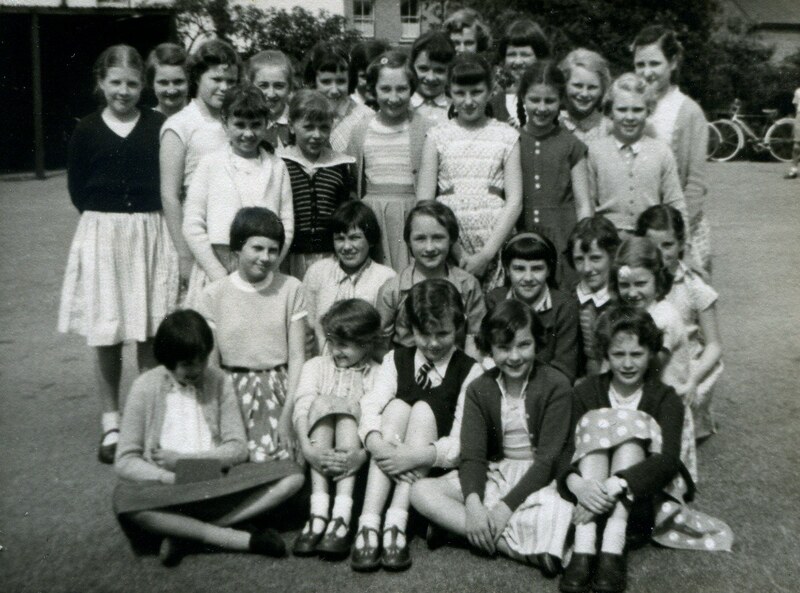 BACK ROW L-R: Sylvia Broad, Jean Hall? , ? , Derek Shearman, Jacqueline ….. , John Furbank, Ruth ….. , Jennifer Bristow, ? , Glenda ….. (Welsh?) , ? , ? , Miss Randall (teacher). FRONT ROW L-R: Nancy Bustin, ? , ? , John Ault, Anne Shepherd, Doris Smith, Peter Stickland, Geoffrey Gadsdon, ? If you recognise yourself, or someone else, let us know. 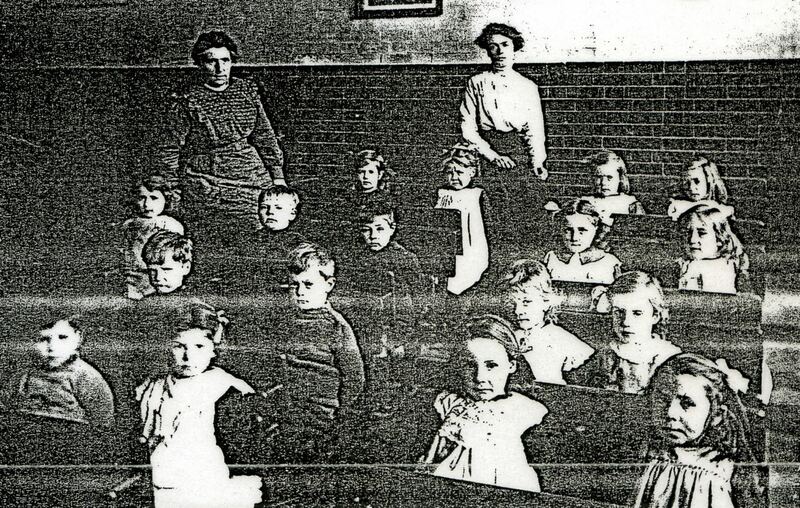 There were another forty children in the B class of the same year group. This was a very full school! 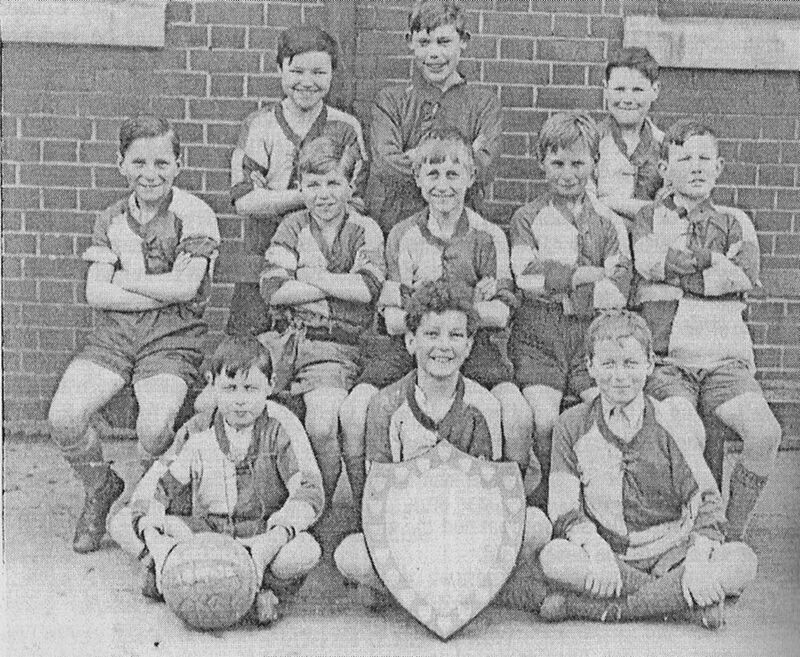 Two names here which the author can identify are Head Teacher Mr R G Dawe (let) and Mr Griffiths, who coached the team. 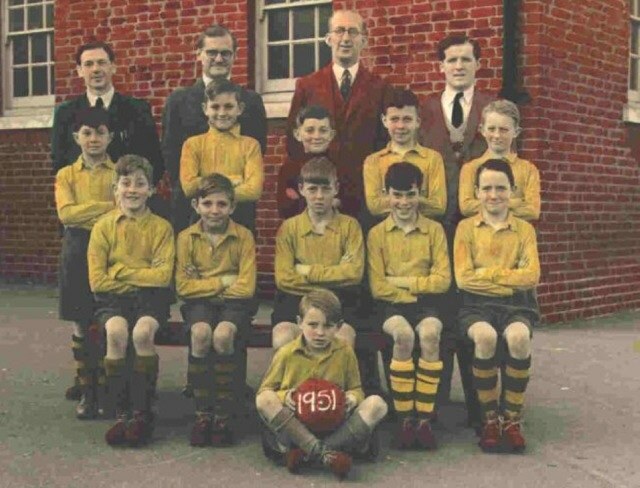 We have no identified all of the players, though not all of their first names! Perhaps you recognise yourself, or a friend or relative. The photo was taken on the Woodstock Road south side of the building a year after the street was given this name. Evidence of several dirty knees suggests it was taken after the match. This is an especially interesting picture. 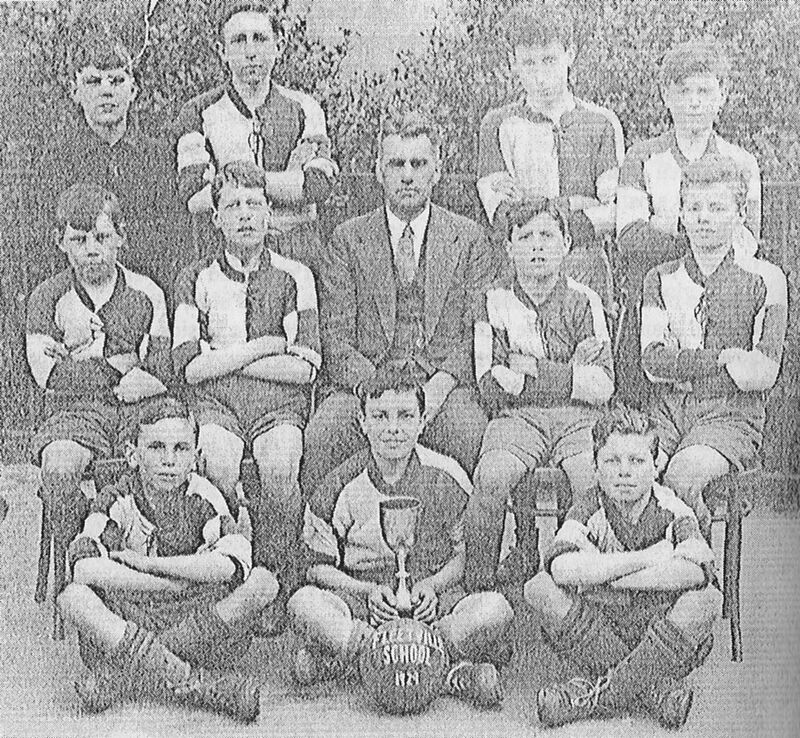 Referring to the Bridle & Burgoyne book, "100 Years: A History of Schools Football in St Albans," it makes no mention of a 1948/49 season. Was there a break for some reason? Or are the records missing? Was this a celebratory picture at the end of a successful season, or simply a representative team picture for the season? 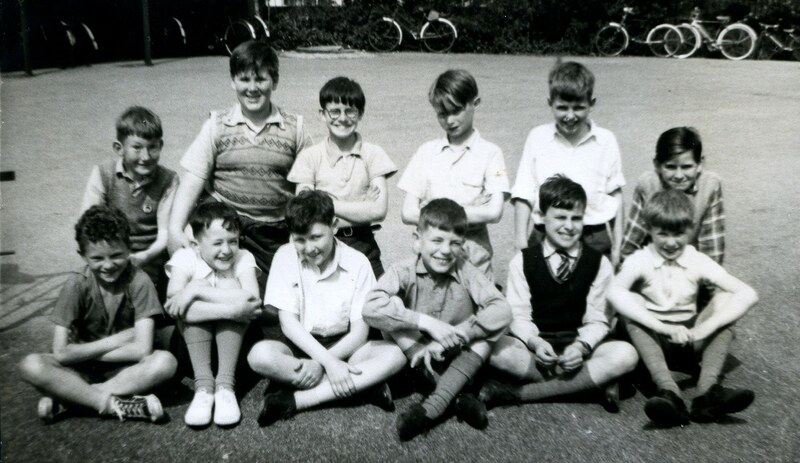 FRONT ROW L-R: Brian Eve, Paul Donegan, Brian Johnnies (Captain), ….. McDonald, Peter Nicholson. You may notice a resemblance between Peter Nicholson and John Nicholson from the 1951/2 team. Photo courtesy Fleetville Infants School & Nursery. 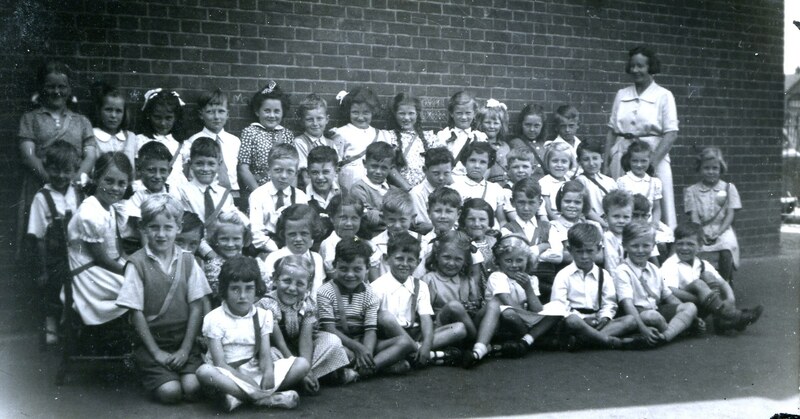 This photograph is undated, but many of the children would be recognised by someone! SECOND ROW L-R: ? , Ruth Martin, ? , ? , ? , ? , ….. McDonald, John Nicholson, Michael Trounce, ? FRONT ROW L-R: ? , Joan Harvey, ? , Brian Johnnies, ….. Godfrey, ? Following the meeting and awards, the Fleetville team was assembled on Fleetville Rec for the celebration picture. 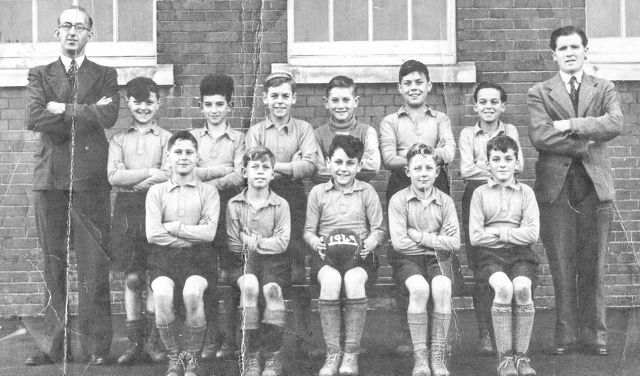 Fleetville School was still an elementary establishment, and team members are likely to have included 12 to 14 year olds. 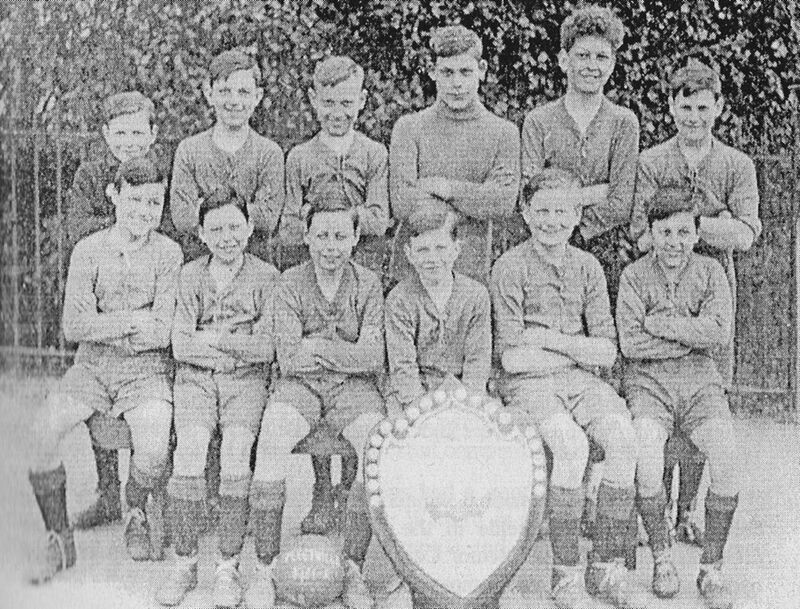 We know that none of the players from 1928/29 were still playing for the school team in 1929/30. We know the names from a match report in the Herts Advertiser. Unfortunately, we can't match the names to the faces. Once again, we know the names from match reports, and also that six players had also played two years previously in the Junior Six Shield match (above). Photo taken on the Clarence Park football field, with the cricket pavilion and former tea kiosk in the background. 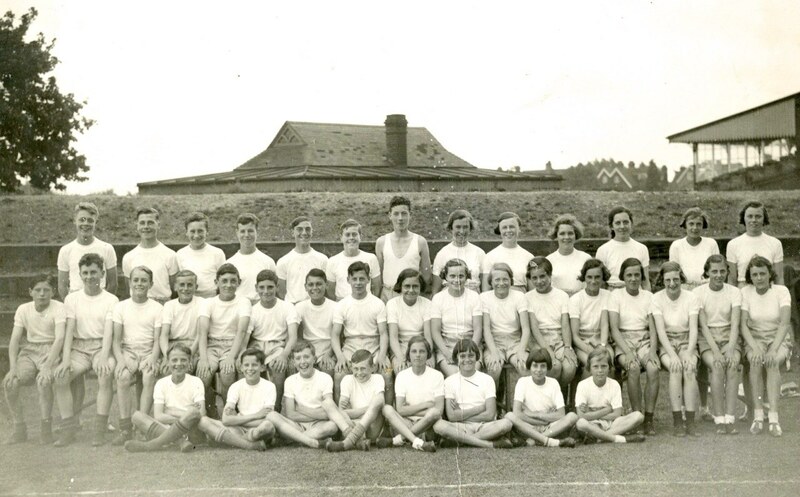 Senior girls were still at Fleetville in 1932, and senior boys in 1933. 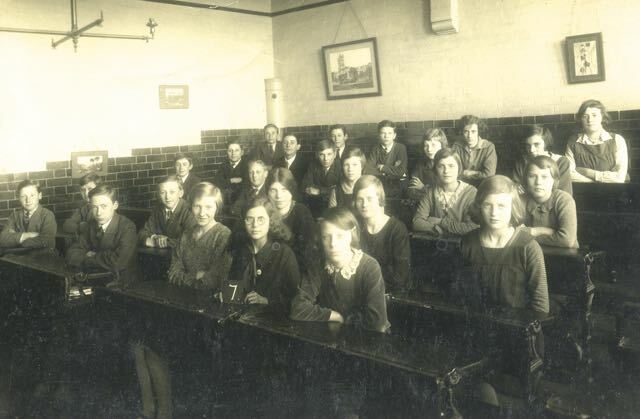 Since most of this group appear to be seniors the photo is provisionally dated to no later than 1932. 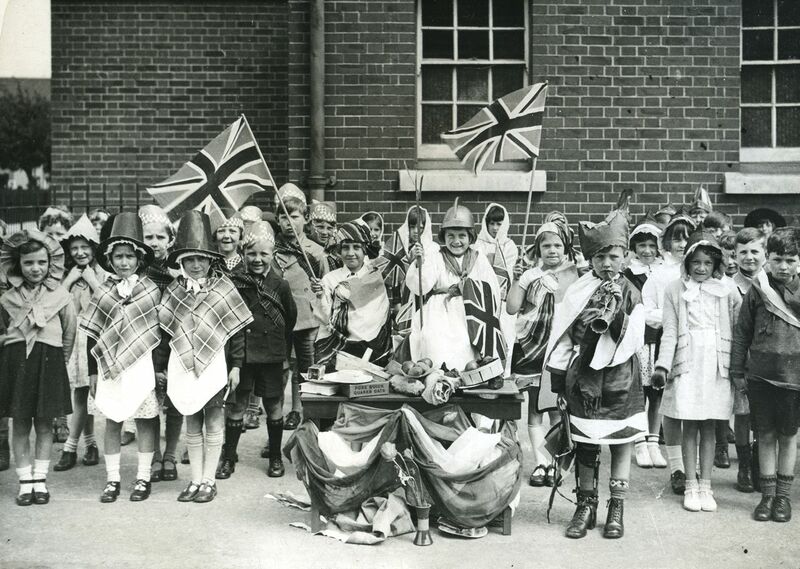 Fleetville Junior School – only some of the children are in this picture – celebrated VE Day in May 1945. 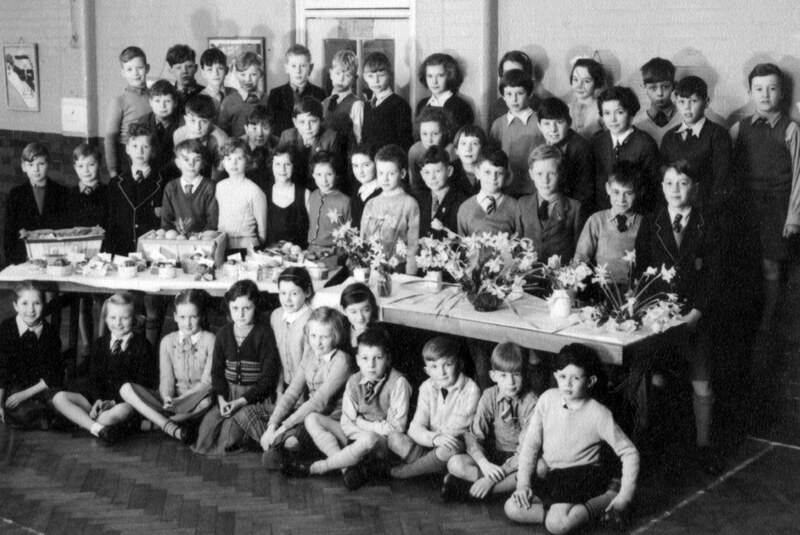 A celebratory cake has a table of its own in the centre of the Junior hall. 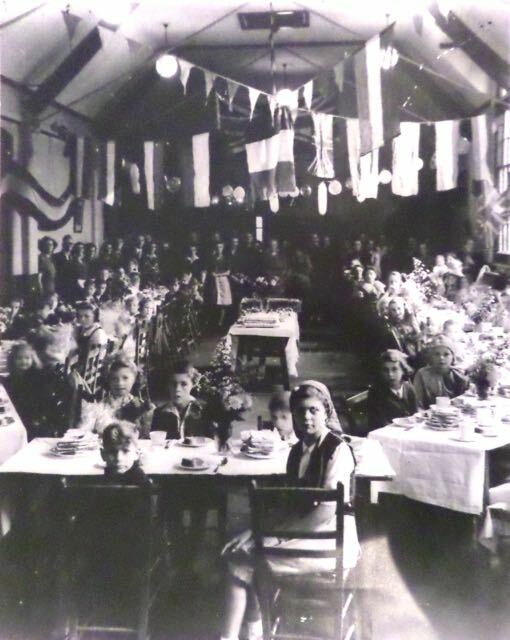 Parents would have supplied sandwiches, and a good number of adults lined the Infants end of the hall, which has been decorated with flags. 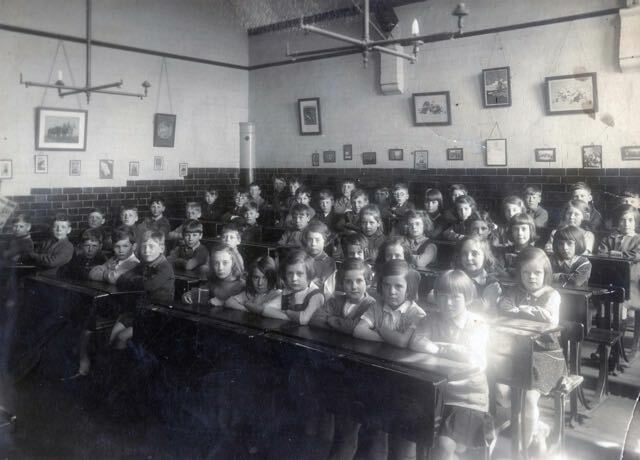 Today, this is the old hall of the Infants school.